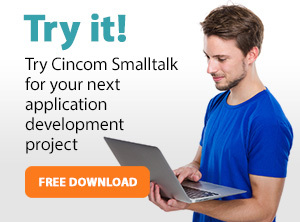 Cincom® ObjectStudio® allows business owners, managers and decision-makers to work together with software developers in creating solutions that solve real problems. Using tools like ObjectStudio’s UML (Unified Modeling Language)-based Modeling Tool, anyone can play the role of architect and literally map out their business, giving a clear picture of their thoughts and ideas to a developer. The Modeling Tool generates the necessary code for software developers to implement functional rules and details. Developers can then use ObjectStudio’s Mapping tool to easily make customizable interfaces from a relational database management system (RDBMS). Backed by Smalltalk, the legendary and original object oriented language, it can tackle virtually any business problem. Using ObjectStudio, you can build applications that integrate completely into the Windows environment while taking advantage of any and all Amazon Web Service (AWS) services you might need. If you need more storage than you can get locally, but still want to deploy Windows clients, this is the answer you want. To learn more about ObjectStudio, click here. To learn more about leveraging the power of today’s multi-core CPUs with ObjectStudio, click here. To see an example of ObjectStudio in the communication field, click here. To see a few examples of how ObjectStudio is used in government, click here.